Over 200 people attended a meeting in Stanwell Moor Village Hall, organised through the residents’ association, on 3rd September, with standing room only. The people of Stanwell Moor face eviction and the demolition of their houses, and those in Stanwell face blight and an uncertain future – the possibility of intense aircraft noise and air pollution if another runway is allowed. There were people queuing outside trying to get in, such was the demand to hear what the Heathrow airport operators had in mind for their area. Nigel Milton, Heathrow’s director of policy, said 850 homes in Stamwell Moor village would be demolished to make way for a 3,500 metre runway – if it was ever allowed. Kathy Croft, chairman of the Stanwell Moor Residents’ Association, said: “It will then be for the next government to act. Kwasi Kwarteng was invited but he gave his apologies … “. The problem of large areas of blight that will inevitably be caused if the Airports Commission put Heathrow on their short list in December is a very real one. There will be another meeting on 18th September, organised by Spelthorne Borough Council. 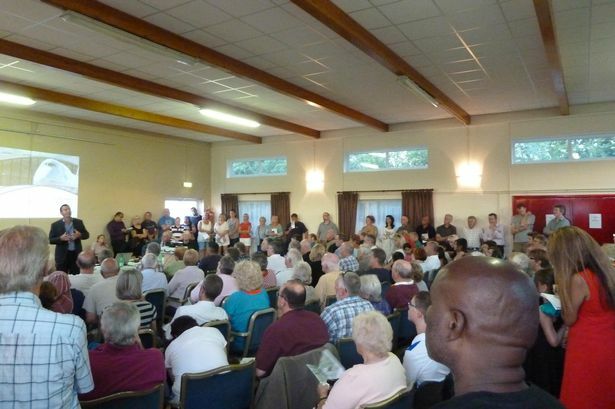 The looming threat of aircraft noise and demolition brought hundreds of residents to a meeting about Heathrow’s ambition to level Stanwell Moor and build a runway directly to the north of Staines. Estimates put the number of people in Stanwell Moor Village Hall last Tuesday (September 3) at “more than 200”, with standing room only and people queuing outside trying to get in, such was the demand to hear what the airport operators had in mind for the area. Those present were told that Stanwell Moor was part of Heathrow’s long-term expansion plans for either a third or fourth runway and that the 850 homes in the village would need to be demolished to make way for the 3,500 metre runway. Kathy Croft, chairman of the Stanwell Moor Residents’ Association, said: “The meeting went well and was well supported. “Heathrow explained what they had in mind and more than 200 people attended. Nigel Milton, Heathrow’s director of policy, explained the proposals and said the Airport Commission would release its findings after the next election, in 2015. Mrs Croft added: “It will then be for the next government to act. Kwasi Kwarteng was invited but he gave his apologies and said he was sitting in the House of Commons that evening. John Stewart, chairman of the Heathrow Association for the Control of Aircraft Noise (HACAN), spoke at the meeting and noted the concern from those in attendance as well as a marked difference in what questions were asked depending on where people lived. He added: “Most of the questions from people from Stanwell Moor were about their houses and about compensation. “The questions from the people in Stanwell were very different. “They were desperately concerned about being, for the first time, under the flight path. Nigel Milton said the meeting was very positive and that the airport was working hard to keep the communities informed. He said: “We understand the process of the Airports Commission is causing considerable uncertainty. A further meeting is planned on Wednesday (September 18) in Stanwell Moor Village Hall, Horton Road, Stanwell Moor, this time organised by Spelthorne Borough Council. The meeting will start at 7pm, and give residents of Stanwell Moor, Stanwell and Ashford North the opportunity to discuss proposals for the airport expansion and the effect it will have on them. Heathrow submitted three runway options to the Airports Commission ”for solving the lack of hub airport capacity in the UK”. These see a third runway placed to the north, north west or south west of the existing airport. [Its report is at Heathrow: A New Approach ]. Heathrow prefers the southwestern option, in the Staines Moor area. Posted: Thursday, September 12th, 2013. Filed in General News, News about Airports, Recent News.